Are you looking for affordable beach wedding packages in Florida? 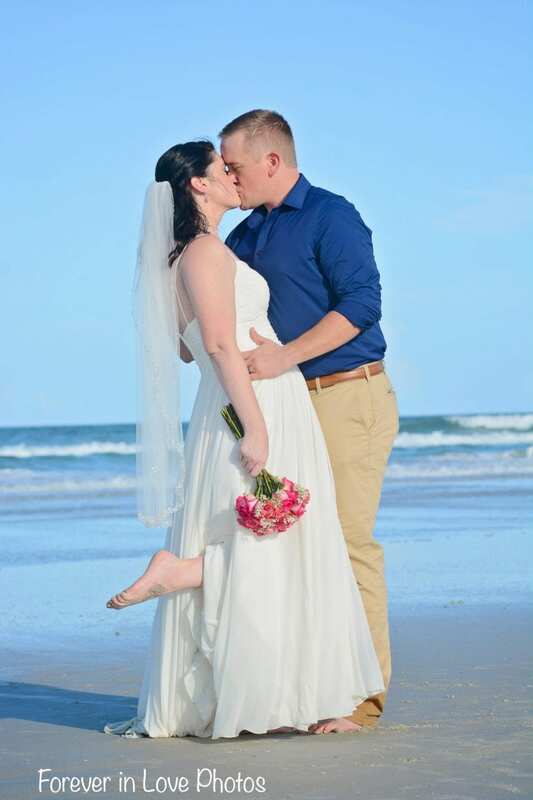 Our Simply Deluxe destination beach wedding package is the ideal way to make your Florida beach elopement as elegant and classic as any wedding ceremony. What makes the Simply Deluxe Beach Wedding Package different than your other simply Packages? 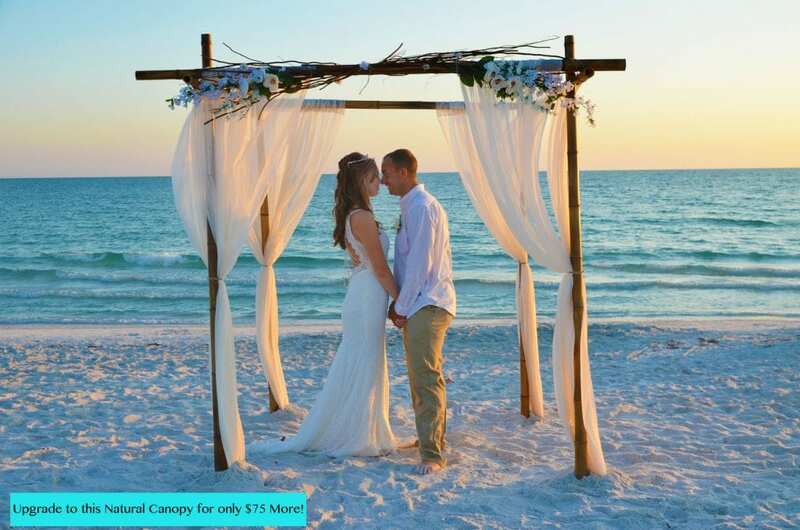 Our Simply Deluxe is one of our most affordable beach wedding packages in Florida for the bride looking for a small and intimate wedding without giving up some of the decor details. Our Simply Deluxe Beach Wedding package includes everything that our Florida Simply Package includes, as well as up to 6 chairs for your guests and your choice of traditional or steel drum music for the bride to walk down the aisle. 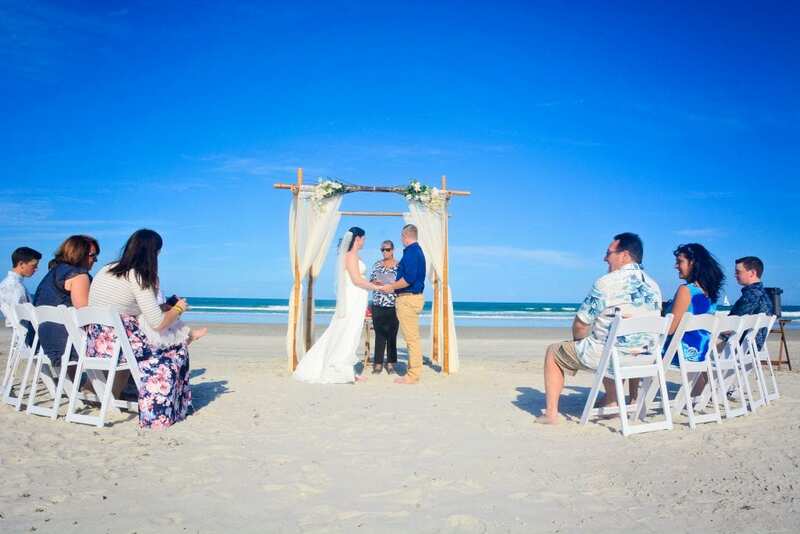 Even though with our Simply Deluxe Beach Wedding Package has the option for the bride to be escorted down the aisle, THERE IS STILL NO BRIDAL PARTY ALLOWED as this is meant to be an upscale Florida beach elopement ceremony. Can I still upgrade to the Natural or Tropical Canopy? 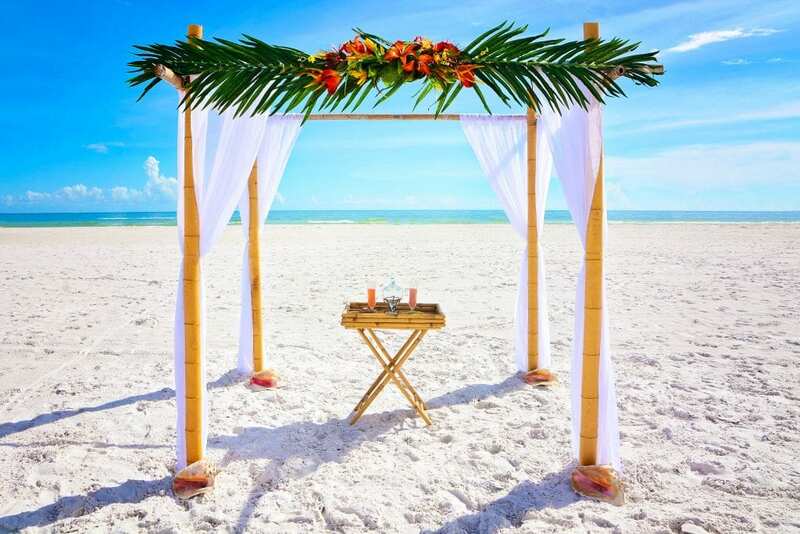 Yes, you can still upgrade to the Natural or Tropical beach wedding canopy for the additional $75.00 fee, or you can keep the decor of the Florida Simply Package at no additional cost. Upgrade to our Natural Canopy for your Florida Beach Elopement Ceremony for an additional $75.00. With this upgrade you will receive our natural large, four post bamboo canopy, draped as shown in your choice of white or ivory material, and complete with a branch and flower canopy topper. Upgrade to our Tropical Canopy for your Florida Beach Elopement Ceremony for an additional $75.00. With this upgrade you will receive our natural large, four post bamboo canopy, draped as shown in your choice of white or ivory material, and complete with a tropical floral canopy topper. Affordable Beach Wedding Packages in Florida- why are they so great? What makes our affordable beach wedding packages in Florida a great option for you? They are all-inclusive and you know your cost right upfront. Instead of stressing over adding up numbers, dealing with multiple vendors, or worrying about if you are going over budget, you can choose our all-inclusive beach wedding packages and know all the details of your wedding and cost right upfront. 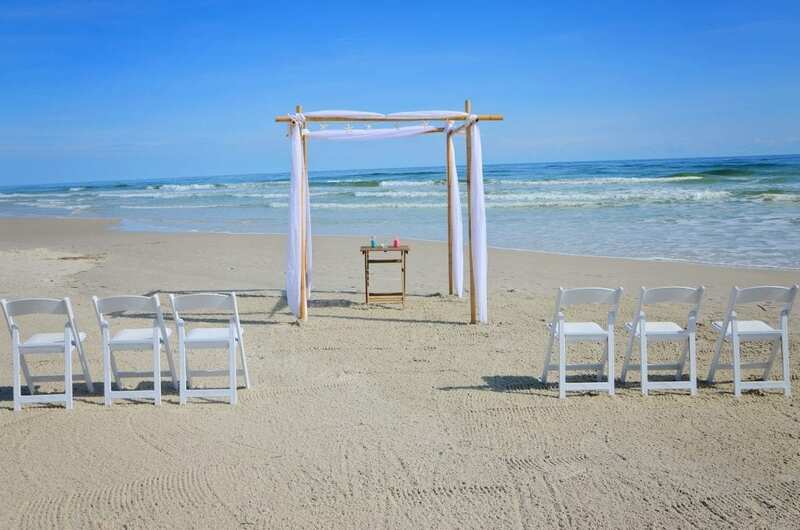 Our affordable beach wedding packages in Florida include everything you need for your beach wedding ceremony to be a success. With an officiant, ceremony photographer, beautiful decor, ceremony set-up and breakdown, a detailed timeline and so much more. Once you reserve your wedding date with us, you will get access to your client portal where you will be easily able to keep track of all of your important documents and see a running tab of your remaining balance, making it easy and convenient for you to stay on budget. Are you looking for a more journalistic approach to your ceremony photography? More poses, for example “trashing the dress’ or a large outlined heart in the sand? Hire our exclusive wedding photography company: Forever in Love Photos ;If you hire her for your ceremony photography, she will replace our staff photographer. She will take all of your ceremony photos, as well as all the after ceremony photos at the beach. If you hire Forever in Love Photography for your beach wedding ceremony, she will take the place of our staff photographer. And, you will receive a $100.00 credit on your package when you use her photography services (this credit cannot be combined with any other discounts, and this credit is not available for the Simply Package) Once your photos are ready, you will be able to download them for free (no purchasing prints from us!). A photo CD is available upon request for only $25.00 (shipping and handling fees). You will need to contact them directly, to check their pricing, and availability. Your independently hired photographer will take the place of our ceremony photographer. You can deduct $100.00 from our package price when hiring your own photographer (not available for the Simply Package). Once the ceremony is over, your photographer will take all the guests to the water to complete your after ceremony photography.This offer cannot be combined with any other discounts.